Tesla officials are investigating a fire that destroyed a Model S sedan Friday at one of the company’s Supercharger stations in Kristiansand, Norway, about 200 miles (322 km) southwest of Oslo, the capital. 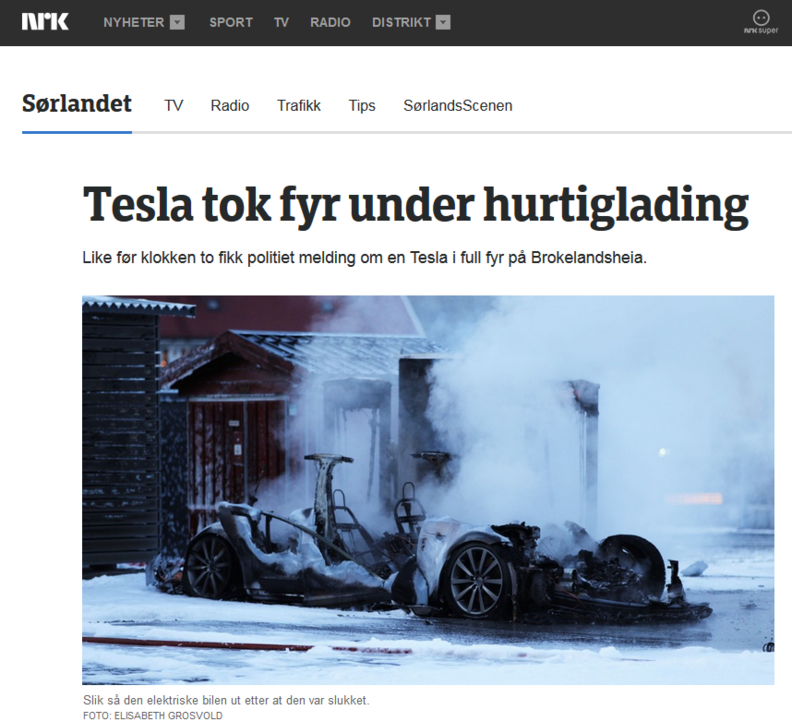 NRK, the Norwegian Broadcasting Corp., reported the owner of the Model S parked the car, plugged it in and then left it to charge before the fire started. NRK said the Model S was a 2014 vehicle. Firefighters could not douse the flames with water because of possible chemical reactions with the car’s lithium ion batteries, the report said. Instead, NRK reported, firefighters cordoned off the car and extinguished the flames with a special foam. The Model S is one of Norway’s top-selling cars and one of the company’s largest markets. In November 2013, NHTSA investigators opened an investigation into the Model S after several fires caused by debris that struck the underside of the car, puncturing the battery pack. NHTSA closed the investigation in March 2014 when Tesla agreed to install a shield under the car to protect the battery pack and to raise the height of the car slightly. Although the Model S was not recalled, owners could have the protective shield installed upon request. It is not clear of the burned car in Norway had the shield.